Penn State offensive lineman Robert Martin has decided to end his football career and is no longer a member of the team. The redshirt freshman posted this to Twitter on Monday night. Martin was a three-star recruit from New Jersey who redshirted in 2017. Penn State should learn something about its 2019 football recruiting class over the next week. Over the next seven days, three of the Nittany Lions’ top prospects have scheduled announcements about what school they plan to sign with. On Friday, Virginia running back Devyn Ford and New Jersey defensive tackle Antonio Alfano are slated to make their calls. Virginia linebacker Brandon Smith posted on Twitter he will revels his choice on May 21. UNIVERSITY PARK — Penn State men’s basketball coach Patrick Chambers has announced the addition of 6-foot-5, 210-pound guard Kyle McCloskey to the roster for the 2018-19 season. 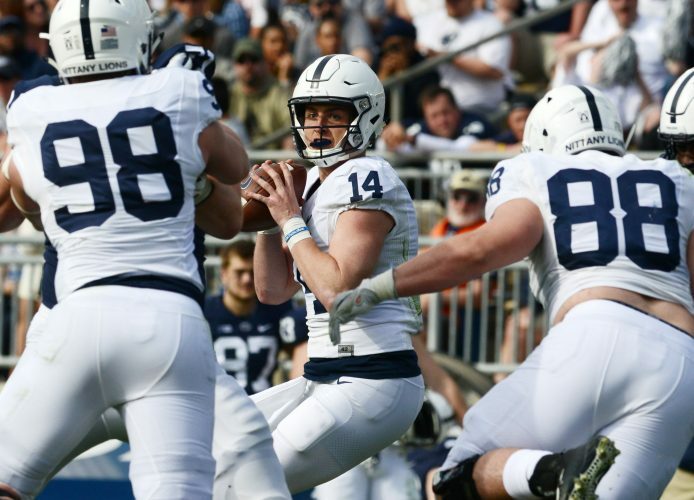 McCloskey was a member of the 2017 Villanova football program before announcing his intent to transfer to Penn State to join the basketball team. McCloskey captained both the football and basketball teams at Germantown Academy as a senior. He was the first Philadelphia-area athlete to throw for 3,000 yards in football and score at least 1,000 career points in basketball. A first-team all-state pick in basketball, McCloskey averaged 21 points and 11 rebounds per game his senior season and helped lead the Patriots to four-straight 20-win seasons and Philadelphia Inter-Academic League championships. McCloskey started for the Patriot basketball team all four years and was selected to the first-team all-league team as a junior and senior. Named MVP as a senior, he finished his career with more than 1,400 points and 900 rebounds. From Lower Gwynedd, Pa., McCloskey earned high honors all four years at Germantown Academy. McCloskey is the fourth member of his immediate family to attend Penn State. His father, Mike, was a four-year letterwinner for the Nittany Lion football team and his mother, Mimi, competed in track for the Nittany Lions. His sister Megan currently competes in the high jump for Penn State’s track and field team while sister Kiernan played basketball at Lehigh.